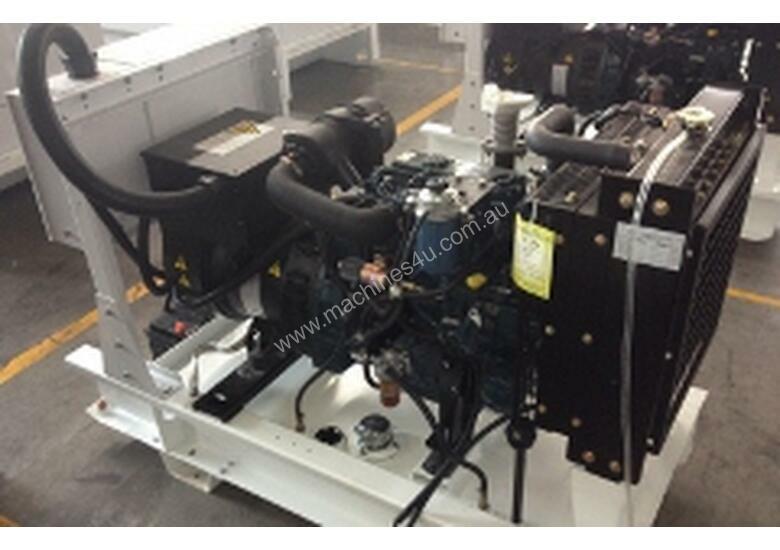 22.5kva 3 Phase 416 Volt 50 Hz Standby Diesel Generator, Designed for Australian conditions. KUBOTA 1500RPM Diesel Engine, Nationwide shipping, Stamford AVR Controlled Alternator with outgoing ABB Circuit Breaker. 24 hr Base fuel Tank, Fully Load tested before dispatch with oil, coolant & New Battery. AMF25 Remote start - simple control panel. Loose industrial muffler. Delivers Nationally. Displayed price does not include Freight. We can upfit other items if needed, this would need to be priced for you. 26kW/33kVA 3 Phase Soundproof Diesel Generator. Perkins Engine. 53kW/66kVA 3 Phase Soundproof Diesel Generator. Perkins Engine. 70kW/88kVA 3 Phase Soundproof Diesel Generator. Perkins Engine. 10KW/10KVA - 240V 1 Phase Soundproof Diesel Generator. ITALY build GERMAN Engine. 53kW/66kVA 3 Phase Skidmounted Diesel Generator. Perkins Engine. 132kW/165kVA 3 Phase Soundproof Diesel Generator. Perkins Engine. 115kW/143kVA 3 Phase Skidmounted Diesel Generator. Cummins Engine. 320kW/400kVA 3 Phase Soundproof Diesel Generator. Perkins Engine. 120kW/150KVA 3 Phase Sound proof Diesel Generator. Perkins Engine. 11kW/14.5KVA 3 Phase Skidmounted Diesel Generator. Perkins Engine. 40kW/50kVA 3 Phase Skidmounted Diesel Generator. Perkins Engine. 85kW/106KVA 3 Phase WeatherProof Diesel Generator. Cummins Engine. 8kW/10kVA 3 Phase Skidmounted Diesel Generator. Perkins Engine.